You. Are. Enough. How much do all of us crave to hear that? Doesn’t it just slow your breathing down to think about it? What you have to offer the world, and even moreso - just who you are is enough. I absolutely LOVE this sentiment from Marcy’s set M-Powering Words. 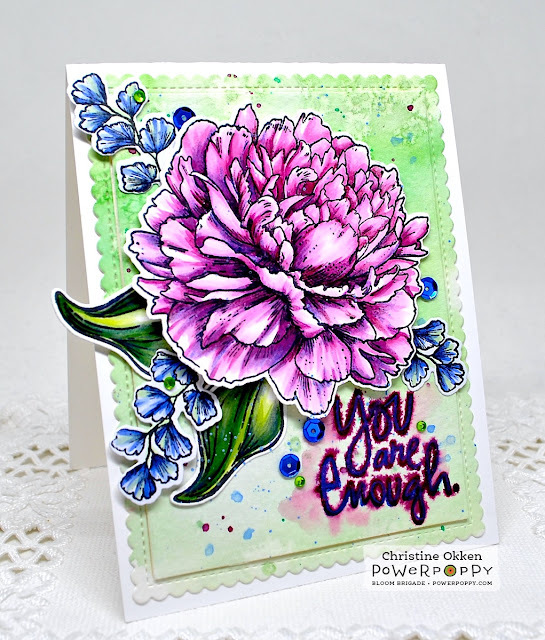 Power Poppy does gorgeous florals which you’ll see, but I think equally good are our sentiments. This set is a beauty, especially combined with the lush florals of Abundant Petals. I coloured up this amazing peony with Copics and finished it off with some Prismacolor Pencils, then I used the Abundant Petals Coordinating Dies to cut it all out and made a pretty arrangement on watercolour paper (which I washed in a pretty background with my Gansai Tambi watercolours) adding salt to the wet background, then splattering with a loaded paint brush. For the sentiment I re-wet the watercolor paper just enough to be damp, not wet, and then inked my sentiment and stamped it in, this way the sentiment could bleed a bit. After it was completely dry I outlined the sentiment with a periwinkle prismacolor pencil to sharpen the details. A few sequins and rhinestone complete the design. Don’t forget about the awesome challenge going on this month for Power & Spark to look up our Inspire Me Monday Challenges and then use one of the techniques for your creation. 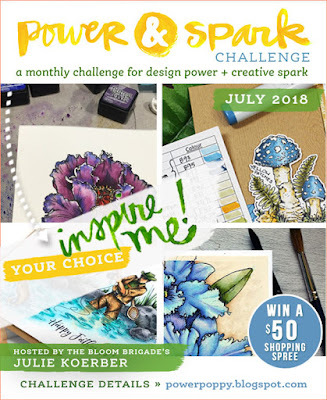 You could win a $50 Shopping Spree! WOW!! This is STUNNING!! And I love that quote. I think that as individuals we often feel were are not enough. Thank you for the beautiful reminder!!! 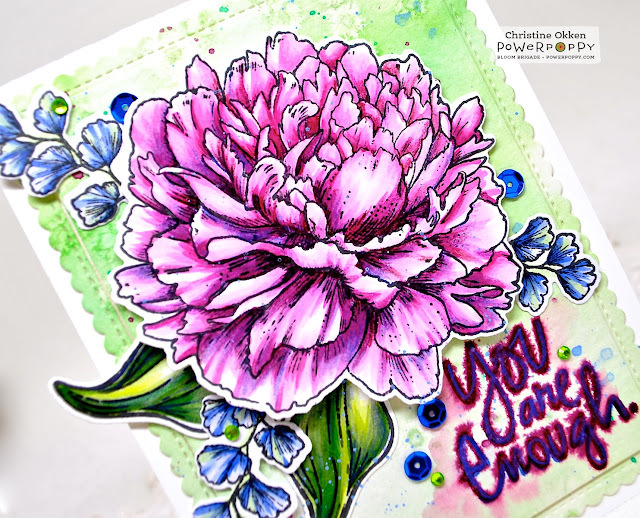 Gorgeous combination of Copics and watercolors!